Enjoy 360 degree views of Lake Superior and Carlton Peak at this unique log cabin home. Eagles Nest is a log home located in the hills above Tofte, MN. Eagle`s Nest has 3 bedrooms, 2.5 bathrooms, and is spread out over 3 spacious stories. The Eagle`s Nest, perched atop the home, provides 360 degree views of Lake Superior and the surrounding Sawtooth Mountains. Enjoy time in the outdoors, away from noise pollution of the city. The spacious open living area on the main level is great for families. Enjoy time sitting in the living room, preparing a meal in the kitchen, or eating in the dining room and never miss a moment. The gas fireplace in the living room provides heat and ambiance in the cold winter months. You`ll love the log-framed furniture that is in almost every room of the house. View of the living room from the catwalk area in the loft above. The cozy kitchen has everything you need to prepare a meal during your stay. There is seating for 3 at the kitchen island. Enjoy the kitchen for preparing meals during your stay. Thanks to the open living area, you will never miss a moment with friends and family while preparing meals There is seating for 8 at the dining room table. Enjoy the open ceiling with wood beams and a cat walk going above the dining room area. The main level bedroom has a queen bed. The loft bedroom has a queen bed. The lower level bedroom also has a queen bed. The main level bathroom features a washer/dryer, great for extended stays. The main level bathroom also has a walk-in shower. There is a half bathroom in the loft. There is a full bathroom with a shower/tub combo in the lower level. The open area of the loft has a futon and TV with a VCR. This is also where you will find the access stairs for the Eagle`s Nest. You can access the catwalk from this area. The catwalk goes over the living room area below and brings you to two reading nooks. Sit back in this reading nook and enjoy amazing views of the Sawtooth Mountains. Or curl up on the reading bench with a good book and peek-a-boo views of Lake Superior. The lower level living room is a great gathering place. Enjoy a game of Foosball in the lower level living room. The lower level living room has a flat screen TV with DVD player, a sleeper sofa, and a board game/card table. The deck at Eagle`s Nest wraps around the front and one side and is a great place to gather to enjoy the views on a warm summer night. Enjoy this gorgeous home as you escape from it all on your next North Shore vacation. Eagle`s Nest is a Winter Wonderland and a great home base for a winter ski trip. There is a seasonal fire pit area with unique chairs made out of old skis. This unique and spacious handcrafted log cabin offers the total experience. With a 360 degree view from the Eagles Nest Lookout, elevated screened porch, and 2309 sq ft of space, you are sure to enjoy your Northwood vacation. 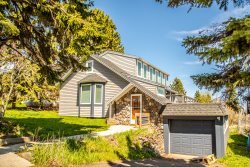 There is 740 ft of deck space, cozy loft for lounging, cat walk, vaulted ceilings, and rec room in addition to 3 bedrooms and 2.5 bathrooms. The cabin is in the Wildwood Acres neighborhood (rural residential setting) about 1.5 miles north of Tofte. The area is residential but very quiet and peaceful. One of the largest vacation rental homes available, Eagles Nest is popular among larger families, those planning family reunions, and groups of friends looking forward to enjoying a getaway together. There is enough room for 11 guests so bring everyone to enjoy the Tofte/Lutsen area on Lake Superior's North Shore. Eagles Nest is centrally located to a lot of the North Shore's most popular attractions. Here you are just a short drive away from the beautiful Oberg Mountain Scenic Overlook and Hiking Trail, a must-see during leaf changing season. Head down the shore and check out Temperance River State Park or head up the shore and you will find Cascade River State Park- both great for hiking and enjoying some beautiful waterfalls. The Gitchi Gami Bike Trail runs along Highway 61. The trail is enjoyed by bikers and walkers, alike, taking a scenic ride or stroll along Lake Superior's shoreline. The Lutsen Mountains recreation area is just 10-miles away and offers both winter and summer activities, including downhill skiing, the alpine slide, and a scenic gondola up to the Moose Mountain Summit. Enjoy the many restaurants and live music offered year-round on the mountain, as well. Whether you're visiting in the summer, fall, winter, or spring, the list of things to do is seemingly endless! Summer on the North Shore brings mild temperatures and tons of outdoor activities, including hiking and mountain biking. Color change season in the fall on the North Shore is unlike anywhere else, with colors so vibrant the hills look like they are on fire. In the winter the area is a premier downhill skiing destination and you can easily find snowmobile trails, cross country ski trails, and even groomed fat bike trails. Don't forget spring and "waterfall season". As the snow melts inland and makes its way toward Lake Superior our waterfalls truly come to life and are a sight to be seen. Waterfalls also form along the edge of Highway 61 so you can enjoy them during a leisurely drive up and down the shore. Be sure to experience every season at Eagles Nest. Note: To reach the Eagles Nest requires climbing 2 flights of stairs and a ladder, with heavy doors - this is not recommended for small children or those with accessibility issues. May not be accessible in colder months. Both times I made phone calls to you I received helpful information and assistance. The house was a good fit for our family getaway. We enjoyed the location, the layout and ambiance of the house. We didnt work directly, but it was very convenient to work through email. The whole process was hassle-free. We loved the house. It was well furnished and very clean. Very comfortable for 5 adults and 4 kids. The kids were in awe, said it was the most amazing cabin ever and didnt want to leave. We especially appreciated how close it was to so many of our favorite beaches and hiking trails along the shore. A great stay! It was nice to get a phone call to follow-up on the email that was sent. Great location and enough room for the family. Great views. Great value. Everyone I talked to was very helpful! We loved the Eagles Nest! It was a unique house! It was spacious but cozy! It met our family's needs wonderfully! We loved the Eagle's Nest's views! We hated to leave!!! Cascade Vacation Rentals was easy and made the reservation process a snap. The Eagle's Nest house was perfect for 5 ladies to enjoy a4day stay. We loved the location away from neighbors and it was easy to get to from Hwy 61. Not having a TV was also very ice-it allowed for many game nights and movies. Those of us with Verizon had no problems with reception. The interior was beautiful and spacious! We enjoyed our stay. The house was great. Lots of room and fully equiped. The only we missed was TV. Unfortuantely we had to leave a day early, as I had a family emergency. Will consider staying there again. My groomsmen and I stayed at the cabin before my wedding on 08/27 and it was just a cool experience! The cabin was pretty clean, a nice and cozy place, and just so much fun! We loved having the foosball table, although it needs a little maintenance it was still a blast! On the top level of the Eagles nest there were some empty beer cans, and there is a torn open seat on one of the chairs but otherwise it was such a cool experience. My biggest wish would be to have wifi at the cabin since I was roaming with T-Mobile and it was difficult to send picture messages, look up addresses, use gps, and send emails. Otherwise the place was absolutely awesome! We had many compliments from friends and family who stopped by. Quite a few people said they will probably stay here next time they are up in the area! -thank you for everything!